Setting classification information for a flow designated as an action on an entity helps organize that flow within the entity&apos;s Action	menu. This is useful if you have defined a large number of actions. Without a classification, the action becomes part of the main navigation for a folder entity. This example uses an existing user defined folder extension data type, called CapExProjectRequest	, which represents a company&apos;s capital expenditure project. 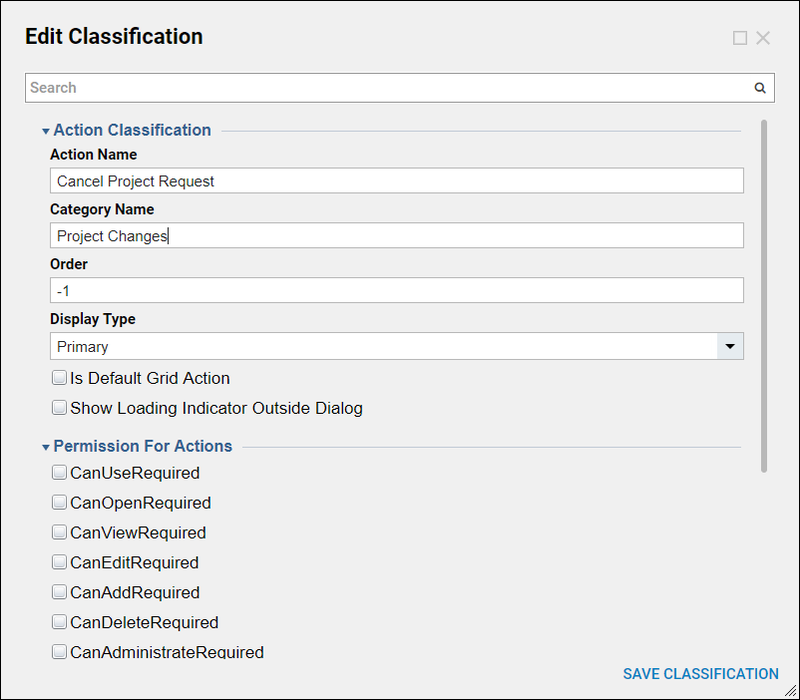 The example creates a new classification of Project Changes	in which the action flow for Cancel Project Request	is found. This creates a menu option named Project Changes	. Go to a Designer Folder. Go to Create Datatypes/Integrations. In the dialog selectConfiguration Extension > Add Folder Actions and Configuration,	choseCreate. This is the type of folder required to create an action on a user defined folder extension. It is possible to create multiple folder action folders. In certain use cases, that is the recommended approach. The reasons that you would want to create multiple actions are to (1) better organize by functionality, and (2) apply different security (thus restricting users to see only folder actions relevant to them). After the folder is created navigate into it and select the Add Action	button in that folder and define the flow that will perform the action. It is not necessary to specify a template from which the flow is made; by default, its flow behavior is designated as a folder behavior flow by nature of being created in that type of folder. In this example, the flow is left simply with the Start	and End	steps connected. To classify the flow, right click the flow and select Set Classification Info	. Complete the Action Classification section. Action Name	- The name that will appear in the menu to represent the flow. Category Name	- The name of the category that will house the flow. Order	- The order in which this action will appear, if more than one flow resides in the same category. Permissions for Actions	section lets you specify the user permissions required in order to execute the action. Select Save Classification	to save the classification.